Scandinavian interior design originated from a group of countries called Scandinavia – which includes Finland, Norway, Sweden, Denmark and Iceland, these countries were strongly known for their poor sunlight and probably the reason why the design style is created in a fashion that fills up an airy and well lit room. Scandinavian interior is marked by light, minimalism and functionality; the distinguishing characteristic of this design style lies in its stylish yet casual look. The demand for functionality influenced the design style to prize utility over decoration and when this happens, they believe beauty would come naturally. 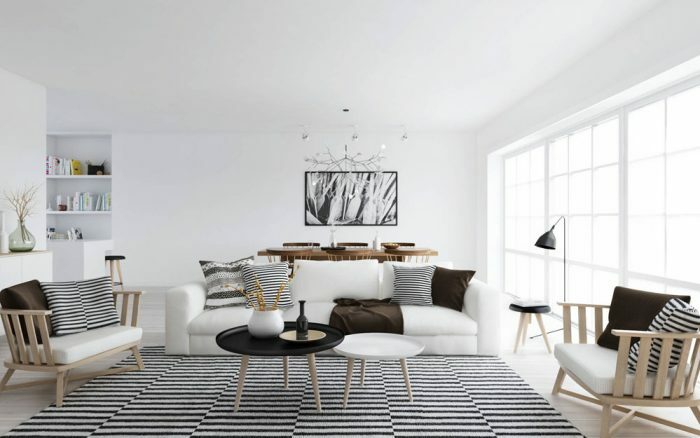 Rooms designed in the Scandinavian style boast of white walls to emphasize light, a neutral color palette, bright pops of color are used in fabrics and area rugs. Natural textures such as wood and stones are used on ceilings, walls, furniture and cabinetry. This design style doesn’t make room for fussy over-emphasized layouts; it embraces clean lines from architecture to furniture. Wall to wall carpets are barely used here, wooden floors are embraced in this design style. Even fabrics follow the neutral theme; cotton and linen are the most commonly used fabric in this design style, usually plain or textured, or sometimes can be found in styles like checks and white. The exception to using the neutral colors in this design style is the frequent use of the color red, specifically put to add interest. Architectural details usually include high ceilings, hardwood floors, leaded glass windows and when it comes to lightings; it’s added with iron chandeliers and sconces as well as simple table lamps. In Scandinavian interior design, there is always a strong relationship between design elements and nature. It is a timeless, fresh and elegant design motif interior style.